Hello again! You may have noticed that we’ve been MIA for the past couple of months. Steven keeps insisting that Graduate School is time-consuming, and I, well, I’ve had a change of philosophy. 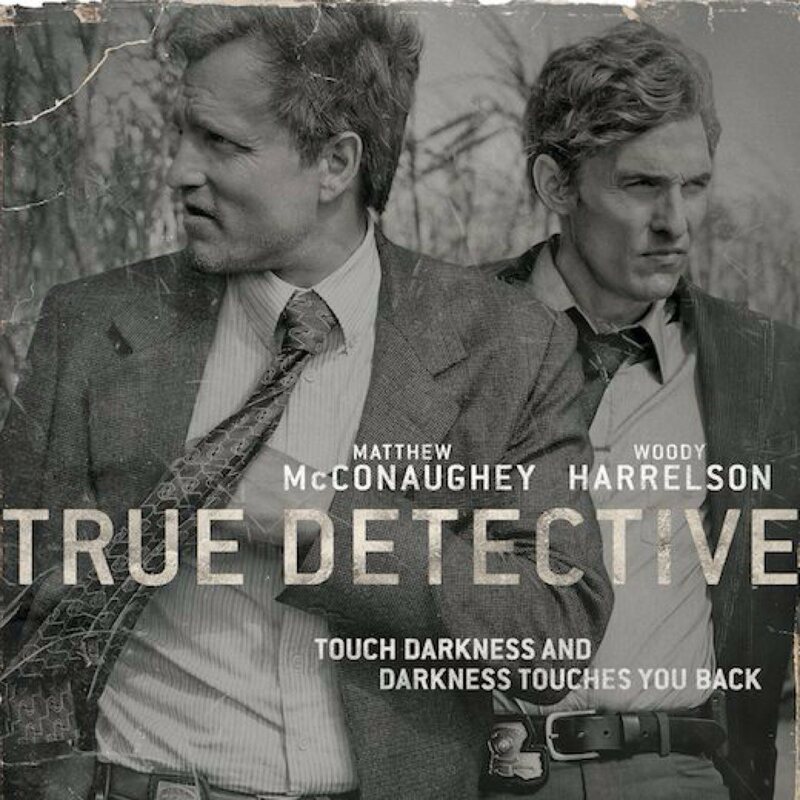 Halfway through this unfortunately messy season of Justified, I gave in to the enormous social media pressure (and some well-timed peer encouragement) and renewed our HBO subscription so that we could experience True Detective with the rest of the world. We waited until the week after the finale and then consumed it in one, big, feverish gulp. It was mesmerizing. It was beautiful. It was dark and complicated and heartbreaking and weird and scary and confusing and every other thing you could want from a TV show. Steven commented afterwards that he wished we had been watching from the beginning so that we could recap it. But I was thankful that we had waited. For one, watching one episode each week would’ve made me CRAZY. It’s just that kind of show. And because it was that kind of show, it led the rest of the world to dive deep into their crazy wells of theories and philosophies and mysteries and rabbit holes. In my experience, a show never holds up well to that kind of scrutiny. It makes people critical of the end product, because of course, nothing can hold up to every single possible theory you had about it. It made me think that maybe we’re doing a disservice to these shows and ourselves by critiquing them on an episodic level. Critics were disappointed in Breaking Bad for not shocking them. For me, Breaking Bad was always leading to one ending, one possible way out. And it was WIDELY discussed and dissected for multiple years by millions of people. How could it NOT have been predictable? Did that make it unsatisfying? Not to the fans who watched because they loved the show. The only negative responses to the finale I read were from the critics who were paid to produce provocative content. To them, the finale was just too simple. Similarly, they were disappointed in LOST for not being the show they thought they were watching. Ditto for How I Met Your Mother. But shouldn’t it be the creator’s right to tell the story they want to tell? If we get it wrong is that their fault or ours? So I decided to make True Detective an experiment. I read a few tweets and headlines here and there about the show. I knew going in that viewers loved the finale and critics found it “problematic.” I knew that it had caused massive speculation and theorizing, especially in the week before the finale. I knew the basic premise of the show. That’s it. 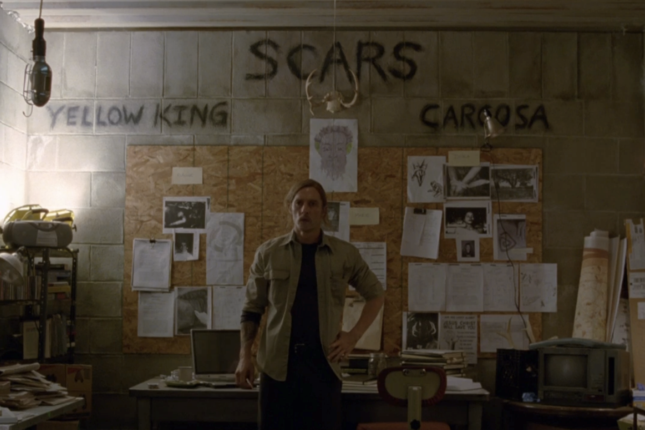 I didn’t read any theories, but had been alive and conscious enough to hear the words “The Yellow King” and “Carcosa.” I was able to watch the show, unspoiled, from beginning to end in about 3 days. I expected to feel compelled to theorize, to become engrossed in the central mystery. It was the most confusing part of the experience for me because there simply wasn’t enough weight given to the mystery to cause me to think too much about it. I was far more interested in the lives of Marty and Rust and trying to follow along with Rust’s drunken philosophies. I wanted to know more about how they came to be and what happened to them. For me, the central mystery was just a plot device, the procedural structure that moved the show forward and connected these two through time. But it didn’t matter to me who the man with the scars was. SPOILER ALERT PORTION: I figured out who the guy was the first time we saw him. If you’ve seen any of these shows, it was pretty obvious. The fact that it was so obvious signaled to me that the mystery wasn’t the important part of the show. The creator of the show, Nic Pizzolatto, tried to reduce the rampant theorizing and build-up to the finale by solving the central mystery at the end of the penultimate episode. And still, people couldn’t accept it. That was by far the most confusing part of watching the show after the fact. What were all those people talking about the week leading up to the finale? To me, True Detective was never about the central mystery of the serial killer. It was about finding grace in a dark world, and learning to confront our flaws and have a little faith that we can overcome them to be good people. I found the finale tremendously satisfying, and a perfect ending to the story of Rust and Marty. That final scene outside the hospital with Rust admitting that he wanted to live, finally able to see that the light was beating the dark, and Marty, tough as nails, so annoyed with Rust’s philosophizing, was so kind to him in that moment, listening and helping to meet him where he was. That was the breakthrough moment of the series to me. That was the climax. All the other stuff in-between was just the vehicle. To have so many “professionals” miss that and get bogged down in how simple it was for Marty and Rust to find and kill The Yellow King just made me sad. /END SPOILER ALERT PORTION. At the end of this experiment, I came away wondering what the purpose of this blog was anymore. Steven and I still love TV and we love talking about TV with other people. But we don’t love dwelling on TV’s flaws. There’s more than enough of that on the internet anyway. So I think for now, I’d rather use this blog to talk about things that I love. To share funny clips and try to convince you to watch Million Dollar Listing and Enlisted and Ground Floor and Parenthood and About a Boy and Trophy Wife and The Mindy Project, etc, etc. So there you have it. Our new mission is to help you watch at least one more hour of television a week. It’ll be tough, but we have faith. Stick with us and we’ll give you all the tools you need. Good luck, godspeed, and stay tuned.